I have a FUN giveaway for you today and I hope you’ll tell your friends and family to enter!! The best parts about summer time are all of the fun opportunities to make memories with your family. Whether your camping out and making s’mores, relaxing by the pool, or just goofing off in the back yard, your family time is precious. It’s worth capturing and remembering forever. 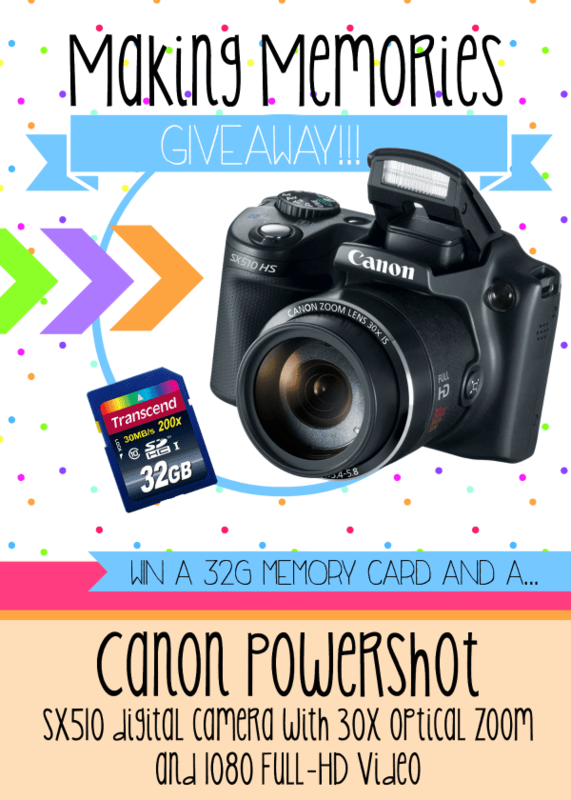 That’s why I’m teaming up with Something Swanky (you can read her post about OneDay.com here) to giveaway Amazon’s #1 Bestselling point & shoot camera, the Canon PowerShot SX510 with 1080 Full-HD Video! It’s super slick and perfect for catching all of those memorable family moments, whether you’re on the go or staying put! This camera is very similar to the one that I used to shoot all of the photos on In Katrina’s Kitchen for the first 2 years. It’s very user-friendly and you turn it on and start shooting! LOVE it!! I hope you win! Simply use the rafflecopter form below to enter to win! This giveaway is sponsored by Something Swanky in coordination with OneDay.com. OneDay.com helps you tell your story, big or small, one day at a time. I like the site — will definitely use it. Thanks.